Chicago bridge is a very popular version of the game, and with our Pocket Size Chicago Bridge Scoring Table, you can be sure of scoring your games of Chicago correctly. We have compiled all of the scoring information you need on this handy table, and laminated it for longevity. Scoring information includes Bonuses, Slam Scores and Doubles Contracts. Do Honours Score in Chicago? This is a hotly-debated question that we’ve been asked many times, with some players adamant in their point of view. We’ve always printed on our chicago score cards that Honours score, but there are alternative sources of score cards on the market that are printed incorrectly with the wording “Honors don’t score” which has led to the confusion. The answer is, contrary to popular belief, that Honours do score in Chicago. It’s only games of Duplicate where Honours are not scored. 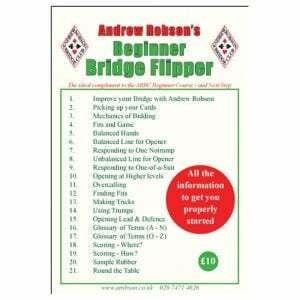 This information has been verified by The Andrew Robson Bridge Club and the American Contract Bridge League. You can rest assured that we take the time to research information before we print it, so you can trust both our Chicago Score Cards and our Pocket Size Chicago Bridge Scoring Table to be correct.